Due to its rich history, ancient culture and excellent location, on the shores of the Mediterranean, Egyptian cuisine has rich ingredients from both the sea and the fields that cover its vast territory. The invasions and conquests that they have suffered in the past have left a legacy of numerous foods from the Middle East making their cuisine more similar to Arab than African. Meat is one of the most used food in the preparation of their dishes. Also bread and yogurt sauces, which resemble Turkish and Greek due to the expansion of the Ottoman Empire. In Egyptian cuisine there is no shortage of rice, with which some of its most popular dishes are prepared, such as mashi and kushari. It is also a gastronomy rich in sweets, where you can find delicious delicacies such as baklava. This Arabic dish has its origins in Ancient Egypt. Traditionally, many of the farmers ate it for breakfast, since it was the staple food of the day. Composed of fresh bread and hard bread mixed with yogurt, fatteh can be accompanied by chicken and aubergines or chickpeas. Today, this Egyptian delicacy can be found in most restaurants in the country,often in different variations. These balls of minced beef or lamb are very typical in Arab countries. They are usually seasoned with spices and onions, which gives them a certain sweet taste. They can be roasted, fried or cooked, and are usually accompanied by tomatoes, pitta bread, rice or vegetables, depending on the restaurant and region. Although they are not unique to Egypt, due to their popularity they can be found on almost every menu. Very popular in the countries of the Middle East, the kebab is composed of lamb or chicken meat. Unlike the classic Turkish kebab, in Egypt it is usually served on a skewer that is baked in charcoal with parsley. Depending on the restaurant it can be accompanied by vegetables, also roasted, or rice and salad. One of the most popular is the kebab Hal-la, which is cooked in a pot with onion and is accompanied by roasted potatoes, in addition to rice and is then covered with a meaty sauce. The kushari is one of the best known dishes of Egyptian cuisine, although its origin is Persian. It is composed of a base of rice, lentils and chickpeas seasoned with a little garlic and vinegar and finally covered by tomato. Although it is a dish of vegetarian origin, depending on the region of the country and restaurant is sometimes also included pieces of meat. The kushari is one of the tastiest dishes in Egypt, although the tomato sauce is usually quite spicy and for some palates can be a little too spicy. The origin of the baklava goes back to ancient Mesopotamia. Throughout history, due to the invasions and conquests of the peoples of the Middle East, this sweet began to spread throughout the Arab territory making it today one of the delights of Egypt, Turkey, Iran and Syria, among others . Consumed as a dessert, the baklava is composed of thin sheets of puff pastry dipped in honey or syrup that are usually filled with almond paste, hazelnuts or other nuts. They are cooked in the oven and, usually, their shape is triangular. It is served as an accompaniment to tea or coffee. In Egypt it is common to find different poultry dishes. One of the most popular is the stuffed pigeon. Their main characteristic is that they come from the organic hatcheries, so they are healthy birds. Although traditionally cooked for special occasions, because of its popularity today it is possible to consume it throughout the year. In many restaurants it is usually served whole, stuffed with pieces of liver and gizzards finely chopped and seasoned with salt, pepper and oil. They are served with a salad, vegetables or rice. Also called as okra, this vegetable little known in the West is very common in Egypt, where in ancient times it was used as an ingredient in delicious dishes. Although there are different specialties that incorporate the bamia, the best known of all is the one that is made with tomato and that includes meat, onion, salt, onion and lemon juice. Its main characteristic is that it provides nutrients and fiber, which is why it is a very healthy option. The mashi is one of the simplest Egyptian dishes, but no less tasty. It is composed of rice which includes minced meat, spices, grape leaves, tomatoes, green peppers and aubergines. In some restaurants nuts are added at the end such as almonds, pine nuts, nutmeg and pistachios. A healthy and tasty mixture that is prepared in many of the country's households. One of the tastiest dishes in Egypt. It is composed of beef that is cut into small pieces and seasoned with salt, pepper, and other spices. Later it is mixed with bulgur wheat and other vegetables and, once it is all mixed together, it is cooked in the oven. In some restaurants, they also add pine nuts or other nuts. It is usually consumed cold and accompanied by yoghurt sauce or hummus. This delicious Egyptian dessert adopts the name of its main ingredient: the kunafa, a sweet spiced dough that can be found in most Arabic bakeries. Throughout history it has been consumed by different countries in the Middle East, the Balkans and the Eastern Mediterranean. Although it adopts numerous varieties, the most popular kunafa is one that is made with mozzarella cheese, butter, sugar and lemon juice. 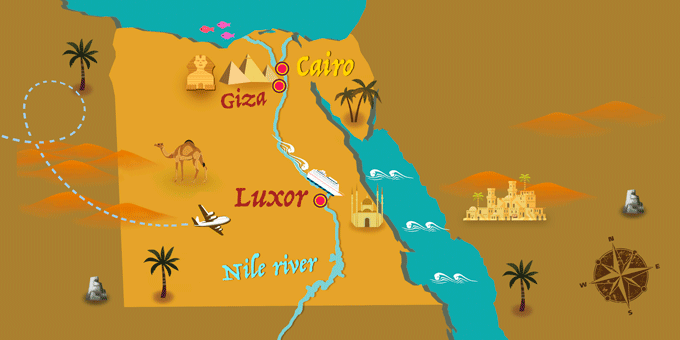 If Egypt has caught your attention, leave us your number so we can call you to discuss the voyage that awaits you.